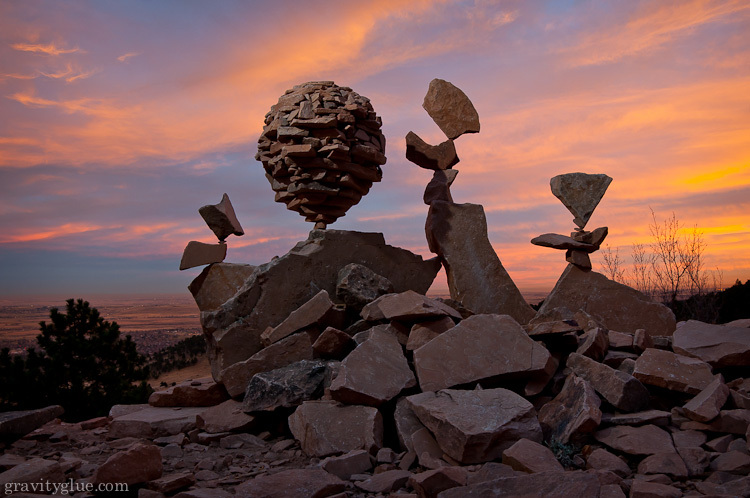 The artist who did this, Michael Grab, is a balancer of rocks. In an interview on Compliment Vices, he describes what happens when he builds these sculptures in front of live audiences, which, apparently, he's done a few times — in Costa Rica, in Italy. Once, at the Boulder Creek Path Festival in Boulder, Colo., a guy came up to him and said, "My brother absolutely does not believe these are balanced like this. He thinks there's bars or glue." He demanded proof that these sculptures were for real. "Everybody's watching, everybody heard the whole exchange," Michael says. "So I just go up and tap one in the middle and it just collapses. And everyone is like [gasp!] So I just like, get down, start making it again. Make it a tiny bit different." After that, he says he has to "find a zero point, or silence within myself." I'm not sure what that means, but it's my sense that the man's got great hands, hands that can feel the exact weight of a stone and a mind that can concentrate, and somehow get inside these stones, and, as he puts it, "Become the balance." I think Michael, when he does this, crosses the line between animal and mineral. For a brief time, he is what he builds. I've gone on my fair share of road trips and invariably I come across random rock balance-art. Not saying it's by the same person. I highly doubt it. But yeah, it's very cool to see stuff like this when least expected. It does have a Zen like quality... Doesn't it.